I'd like you to "meet" a new friend of mine, Mukkove Johnson. She is an author of Christian children's books, and also a new member of the Gabby Moms program of which I took part in last year. Mukkove and I swapped books recently. I sent her the book I wrote about Communion, and she sent me the book she wrote called, "Christmas is About Jesus," which is a devotional to be used during the advent season. If you have young children, this is a great book to use with them. The book uses the symbols of Christmas, from candy canes to Christmas carols, to help parents keep their children focused on the Lord. It consists of color photos, Scripture references, and a short devotional for each day from December 1st through the 24th. 1. Tell us about yourself, Mukkove. I have lived in Alaska since I was about 9, so it is home. My husband and I married in 1994. We love this state, our home, and our community. We have 3 children in our home and one in heaven. I educate our children at home and where ever we go. I love to create things of beauty and process my thoughts through writing. 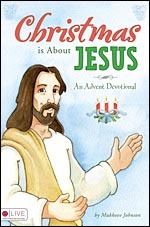 Christmas is About Jesus: An Advent Devotional was published in 2009 by Tate Publishing. It is written for families to read together each day of December. Each day shares a way that common sights of the season can remind us about Jesus. Each devotion is short enough to hold young ones attention and has a picture for them as well. Written into the devotions are questions to engage every member of the family. I hope the devotions give families a ground work to teach their children what they believe. 3. Tell us a little bit about the publisher. Tate Publishing was founded by Christian authors Richard & Rita Tate because of frustration with their experience with traditional publishing. I found them by what I like to call a “divine internet search”. After several attempts of researching the options for publishing my book – all shut down by information overload – Tate came up at the top of the search. I visited their site and read their statement of faith. I knew this was where I wanted to pursue publishing. 4. Is this the first book you’ve had published? Yes, Christmas is About Jesus is my first published book. It was a far different experience than I expected. Marketing has been even more surprising than publishing. I’m always learning and trying to balance my calling to homeschool with the efforts to help families find my book, what I hope is a useful tool. 5. What inspired you to write this book? I wrote this book when my children were preschoolers and they still enjoy it now as they are all double digits. I began to think about traditions from my childhood and how they reflected or didn’t reflect what I wanted my children to know. I knew I could not keep my children from our culture, so I decided to influence what they would think when they encountered the culture. 6. How do you see this book being used? Our family reads one devotion each day, usually at breakfast (that way if we miss we might get it at bedtime). I made ornaments to match each devotion. My children take turns hanging up an ornament each day. After reading the devotions when we see the things out in the store we talk about how they can remind us of Jesus. Ideally I would like to see families read each devotion together and use it to fuel discussions as they go about their daily activities. 7. Are there more books in your future? One for sure, though I hope to have as many more as I can write to be useful tools for families discipling their children. Easter is About Jesus: Family Devotions for the Easter Season is going through the publishing process at Tate right now. It will be released in 2012. There are several options to stay informed. My website: Kove’s Cove, Facebook, and Kove’s Blog. At each of these you can sign up for my newsletter. 8. Do you have additional resources or suggestions? I have made printable coloring pages and ornaments to match each devotion. I also post additional activity ideas each day of December on the Christmas is About Jesus blog. Ideas include simple crafts, songs, websites, videos, service projects, and more discussion questions. 10. Is there anything else you would like to say that hasn’t been covered already? Thankyou for sharing with us, Mukkove. It has been a pleasure getting to know you, and I look forward to using your book with my own children this coming Christmas. Thank you so much Vicky! It has been nice getting to know you, another mom with a passion to help other moms. I have enjoyed getting to know you as well. Blessings on your publishing and marketing endeavors.